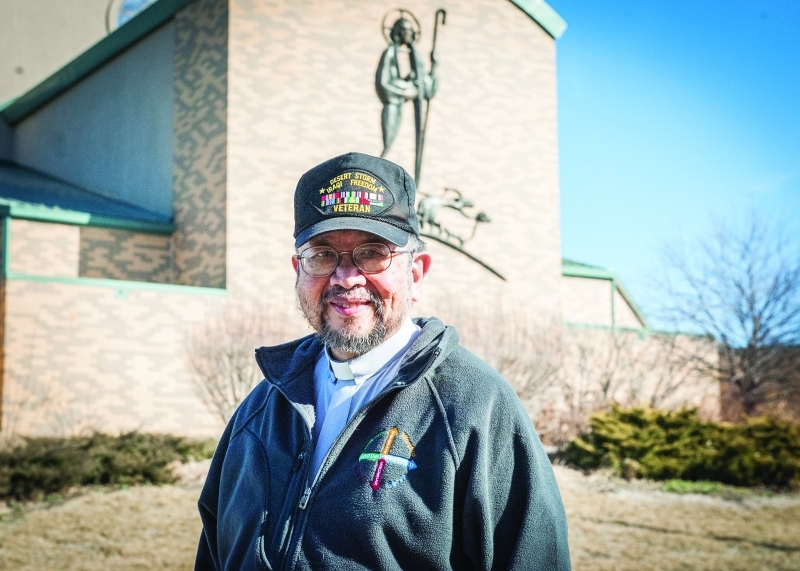 Deacon Marcos Navarro of Good Shepherd Parish in Shawnee once considered the priesthood, but ended up spending 33 years in the military instead. After his retirement, Navarro was looking for ways to do more for the church. Bridge builders. Servants. Heralds of the Gospel. Those are a few phrases Leon Suprenant, co-director of the archdiocesan office of the permanent diaconate, used to describe permanent deacons. From the Greek word “diakonos” for “servant” or “minister,” Suprenant emphasized that a deacon is a man who is ordained to act in the person of Christ the servant. “The deacon has a ministry of the word, liturgy and charity or service,” he said. According to the U.S. Conference of Catholic Bishops, “the diaconate is the first of three ranks of ordained ministry.” The ranks are bishop, priest and deacon. Deacons can be transitional, meaning they are preparing for priestly ordination. Deacons can also be permanent deacons, meaning they are not preparing for priestly ordination. Married men may be ordained to the permanent diaconate, and single men can be ordained to the permanent diaconate with a commitment to celibacy. Although the permanent diaconate was practiced in other parts of the Catholic Church, within the Western church, it fell dormant until the 1960s. Acting upon the Second Vatican Council’s recommendation, Blessed Paul VI formally reinstituted it, but left it to the various national bishops’ conferences to implement it. The archdiocese is among the last within the United States to do so, Suprenant said. The idea originated with Archbishop Emeritus James P. Keleher, who appreciated the various ways permanent deacons served in his hometown of Chicago. He saw potential to implement the diaconate here and, over time, according to Suprenant, shared his vision with archdiocesan priests. The first cohort (class) of permanent deacons started its five-year formation program in 2006. In 2011, the archdiocese ordained 17 men as permanent deacons with plans for a second cohort. This past June, the archdiocese ordained another 17 men. The profiles here offer a glimpse into four deacon’s ministries. Married for 24 years with four children ranging in age from 12 to 19, Deacon John Weist is currently assigned to St. Michael the Archangel Parish in Leawood. An attorney in private practice, the idea of becoming a deacon initially caught him by surprise. In fact, he tried to dismiss it. Father Bill Porter, then pastor, suggested to Deacon Weist and his wife Zena that the couple should consider applying. At the time, three of their children were under 7. Another was due in three months. He worried about the demands already on his time. After much prayer, he applied for the five-year program. 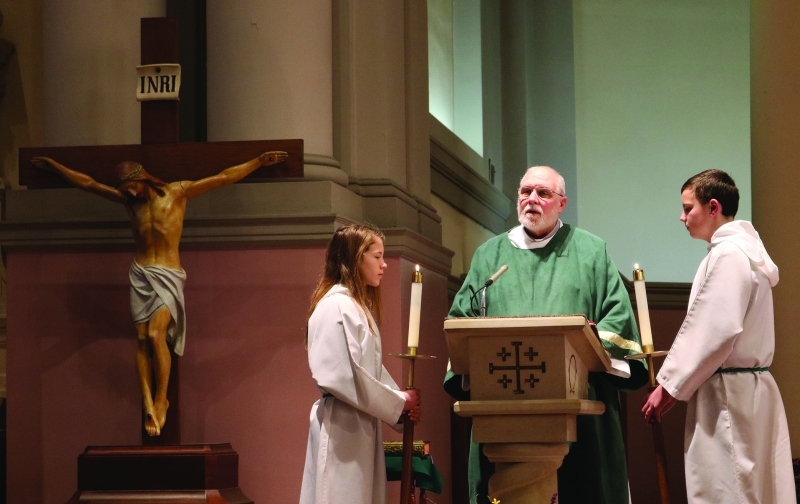 Ordained in 2011, Deacon Weist has, according to the parish’s current pastor, Father Brian Schieber, served the parish in numerous ways, including as a spiritual director at Christ Renews His Parish retreats and for individuals. “Deacon John has a great pastoral sense and love for the faith and the people,” Father Schieber said. In addition to serving the parish, Deacon Weist has an assignment outside the parish as chaplain to the Overland Park Police Department. Again, the idea caught him by surprise. One of his fellow parishioners, Michael Ernst is deputy chief, and oversees the chaplains. One day, the two were talking about the need for a Catholic chaplain. Ernst said the department had tried previously to find one but the demands on priests’ time made it challenging. In 2016, he underwent chaplaincy training. He has found the assignment brings comfort to not just police officers, but also families affected by emergency situations. Serving at Mass, though, is what brings him the most joy. Intimacy with Jesus in the Eucharist is something that Deacon Don Poole and his wife Judy had to find over time. Up until he married in 1968, Deacon Poole had not belonged to any church. So he was surprised when later he discerned a call to ministry within the Southern Baptist Convention. “I felt I was supposed to be a preacher,” he said, adding he served as a Baptist preacher for 16 years until his resignation in 1996. Four years later, the couple joined the Catholic Church at St. Rose Philippine Duchesne Parish in Mound City. Initially, it was the hierarchy and authority structure of the church that drew the couple into the Catholic faith. Deacon Poole said he never imagined he’d be one of the church’s ordained ministers. While in the Communion line one weekend, his pastor whispered he wanted to see Deacon Poole after Mass. The deacon wrote a letter expressing his interest but it would take some time for the program to get off the ground. In 2005, the archdiocese began officially to take applications, but, when the moment came to apply, Deacon Poole hesitated. A Sunday homily, though, gave him pause. The pastor discussed how priests need help and support to spread the Gospel message. Ordained in 2011, most of Deacon Poole’s time is spent in service to the parish. 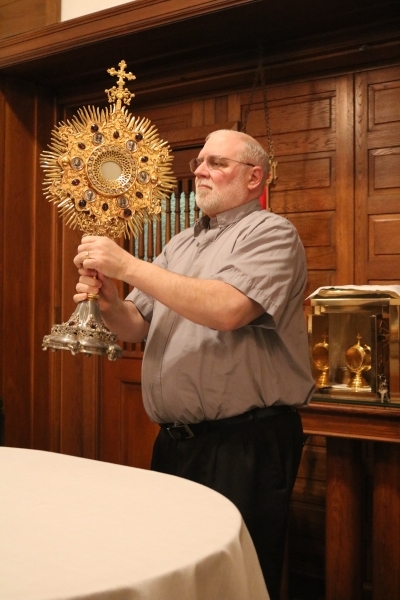 He and his wife own an insurance agency, so a typical day involves at least a few hours at his office before he heads to the church for an hour of eucharistic adoration. Throughout the week, people find him “just doing whatever the priest needs me to do,” like teaching classes for the parish’s RCIA program, visiting the sick and bringing them Communion, providing tours of the church’s shrine to St. Philippine Duchesne, officiating at funeral services and meeting with other religious leaders as they tend to community needs. 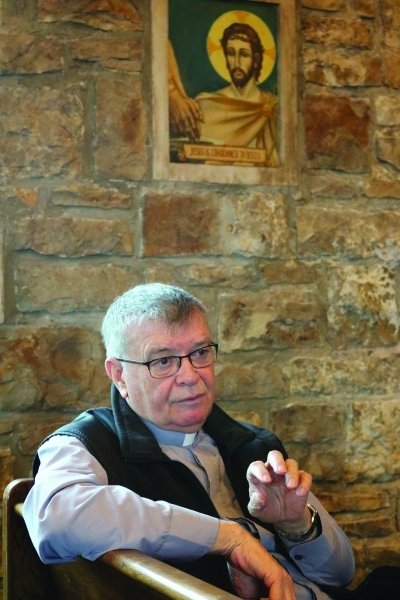 Father Barry Clayton, the current pastor, said Deacon Poole’s background as a Protestant pastor is one of his greatest gifts. Married for 34 years, he and his wife Julia have two grown daughters. Trained as a clinical social worker, Deacon Seago was engaged in marriage and family therapy at Catholic Community Services for 10 years. Currently, he works for the Kansas Department of Aging and Disability Services in Topeka. Within the parish, he has, among other things, taught RCIA classes, assisted at Mass, led rosaries, officiated at funerals, conducted baptismal preparation classes, witnessed a few weddings not in the context of Mass, baptized people, led Stations of the Cross and answered theological questions posed by parishioners. According to Father John Pilcher, the pastor of Mater Dei Parish in Topeka, deacons extend the arms of the church. “Deacon Chris Seago fills these qualities by his willingness to do what he can to make my life as a priest a little easier,” Father Pilcher said. Deacon Seago discerned the call to a clerical vocation as a chance to do more. “I’d always been a lector. I had always been a eucharistic minister. I had my degree in theology and I always wanted to do more for the church than I was able to,” he said. At one time, he had even thought about the priesthood. In addition to his other tasks, Deacon Seago takes preaching seriously. That moment often plays in Deacon Seago’s mind as he prepares a homily. “For me, it’s just a sense of responsibility to make sure you’re authentically handing on the Gospel,” he said. 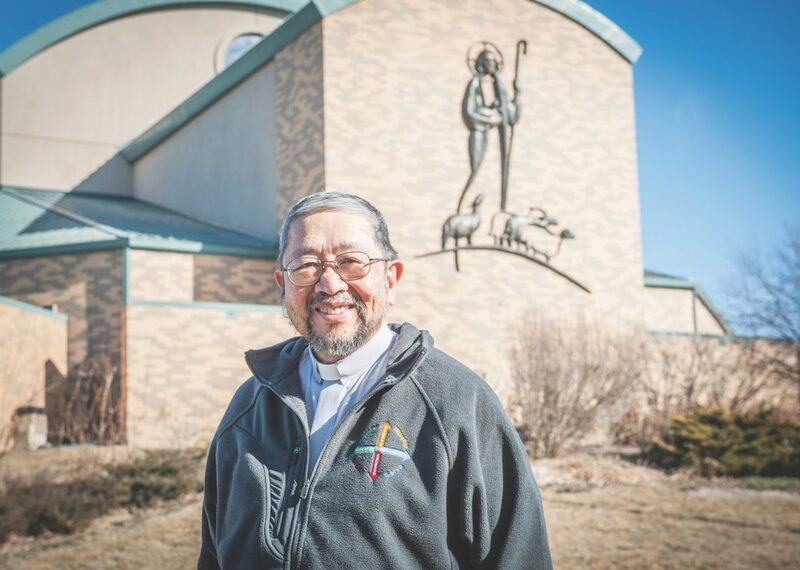 Like Deacon Seago, Deacon Marcos Navarro of Good Shepherd Parish in Shawnee once considered the priesthood. “My calling was otherwise,” he said. Instead, he spent 33 years in military service. “Service was always a part of me,” he said. After retiring from military and civil service, he longed to do more for the church. He decided to investigate the diaconate. He and Angela, his wife of 42 years, attended an informational session. Afterward, he asked numerous questions. Finally, the couple made a formal application. The process took about six months. Ordained in June 2017, he is among the archdiocese’s newest permanent deacons. Every day, he can be found at Mass first. Then, depending on the day, he engages in pastoral work such as teaching English as a Second Language classes, praying the rosary with prisoners at the state penitentiary in Lansing, teaching catechism classes to Hispanic adults and serving on the Regional Hispanic Council of Johnson County. He also leads Communion services at a private prison in Johnson County. He said prison ministry has provided him with countless opportunities to witness prisoners grow in their faith. Deacon Navarro said he also sees the negative side of prison ministry — a high recidivism rate. As a result, he does everything he can to prepare prisoners for the challenges of life after prison and said it’s important for there to be opportunities for them to access in order to reintegrate into society. That’s why he tries to help them find jobs and places to live, and connects them with counseling services and other resources. Good Shepherd’s pastor, Father Jim Ludwikoski, said the deacon shows Christ’s love. “Marcos bring a multitude of gifts.,” he said. “His language fluency in Spanish helps, on so many levels, [Spanish speakers’] ability to understand and process who the church is and what the church wants from them,” he added. Finally, he added, Deacon Navarro’s “caring self assists men in local prisons to know the church is here for them. I love the article and my son Deacon Joe Allen serves in the Archdiocese of Kansas City Kansas. I love him.